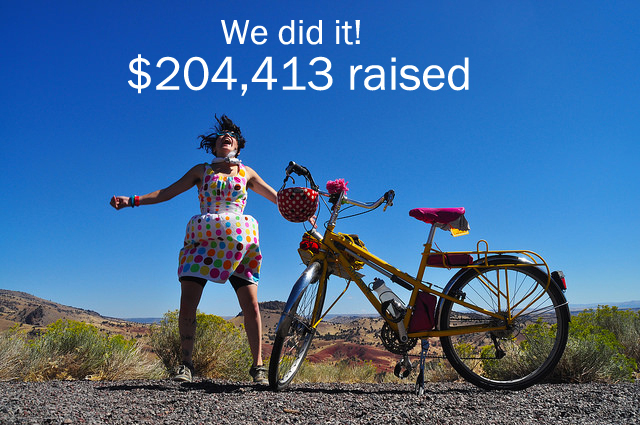 We are wrapping up the most successful Winter Campaign we have ever had at the Community Cycling Center, having raised more than $204,413 of our $203,000 goal, from 576 individuals and businesses. Most notably, a whopping 31% of our donors this campaign are first time donors! It’s a privilege to share the work of the Community Cycling Center with so many supporters. We could not have made this goal without all of the fabulous people of Portland and beyond who were involved in making this Winter Campaign our most successful (and fun) in history. Friends, you were the core of this fundraising success: You sent checks with nice notes, you donated bicycles, and you talked to us about why you value the Community Cycling Center’s work. Many of you built an online transportation advocacy toolkit at the Avenues to Advocacy Hackathon, or helped tear up the dance floor at the roaring 20’s themed Bicycle Ball. Maybe you managed to snag one of our talented shop staff’s hand-crafted beauties in our Balance Bike Buildoff, or you were one of the amazing volunteers who helped 300 children earn their first bikes at Holiday Bike Drive. Perhaps you biked up to the Village Ballroom on a rainy Wednesday to have riveting discussions about the future of the Community Cycling Center at our Jeffersonian Dinner. Perhaps you enjoyed some of Representative Blumenauer’s Fruitcake Ice Cream, or you gave to us through the Willamette Week’s Give!Guide, helping us raise $67,946, allowing us to snag the 6th spot out of 134 non-profits. However you participated, you helped us build healthier, safer communities this winter and into 2015. Whichever pathway you chose to support us during our Winter Campaign this year, we thank you for helping us ride on, and for making this the best 20th anniversary we could ever hope for. Special thank you to our winter campaign sponsor, Lam Research Foundation.